The Sync launched by BitTorrent Inc., which offers the alternative solutions for backup and file storages. Currently, there are many backup and file storage services in the market, such as Dropbox, Microsoft Skydrive etc. With the access of the internet, users can transfer files from computers to the network drive. Such solutions are convenient for users, especially for busy businessmen. However, these solutions have several drawbacks. The network drive is convenient to store the files you preferred. However, the service providers charge users depending on the size required. If users need larger size, more money they are required to pay. The speed for file transfer is also limited. Due to the need of the network, the transfer of files between computers and the network drive is slow. During bad weather condition, the speed of the transfer might even decrease. The most important issue is privacy of the data. Sometimes users would like to store confidential data in the network drive, such as photos, documents, etc. Putting the confidential data into the network drive might have a risk of data leakage. In order to cope with the above drawbacks, BitTorrent is pleased to offer the Sync. With just a few steps of setup, customers can save files directly into their computers. Compared to the network drive mentioned above, Sync offers a complete control on the personal data from the customers. All data is controlled and protected from their computers. There is no service charge from the service providers, which helps to cut the cost. For instance, if companies use the Sync to synchronize folders in mobiles, there is no service charge depending on the file size. On the contrary, if they use the network drive, the service charge might be very high. 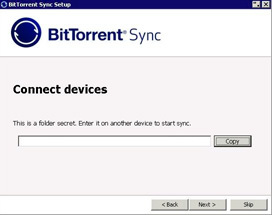 Per BitTorrent protocol, the Sync helps to synchronize folders in computers with other devices, such as iPhones, iPads, etc. The flexibility for multiple devices shall be convenient for customers. In addition, security of the Sync is excellent. With only the private key the users developed, customers can then access the folders in computers. Customers can even setup the expiry date of the private key. If the date is expired, customers cannot log in the folders in the computer anymore. The Sync from BitTorrent is pleased to launch the Alpha version. With excellent and positive feedback, the software is proved to be effective and successful. The Alpha version has already synced for more than 200TB from the launch. It is the first milestone for Sync to achieve. Sync is available for most operating systems, such as Windows, Linus, etc. If you have already faced the difficulties from network drives, you are suggested to download this Sync, and test it. Sync shall change the mind of the existing customers, and enjoy achievements done by it.